Solid maple Arts & Crafts style bed with high or modified low footboard. Contemporary styling gives this bed a simple yet beautiful look. 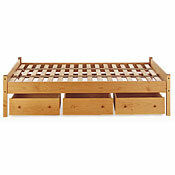 Arts & Crafts Solid Maple Wood Beds available in twin, full queen, king, and california king. Headboard post height 41.5", Footboard post height 22", height under rail 9 3/4", height of platform 14.5". 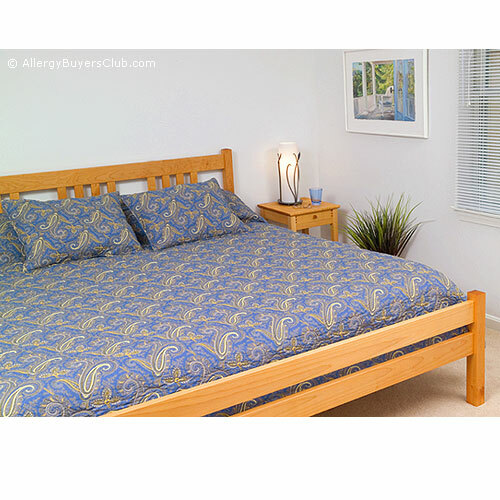 Give your bedroom simple elegance in honey colored solid maple, with this contemporary styled Arts and Crafts bed. 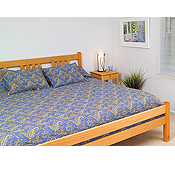 This bed is beautifully crafted with a durability not often seen in a bed which is so fairly priced. Each piece is finished by hand and rubbed with tung oil and pure beeswax and a non-toxic polyurethane finish. The modified footboard option allows you to tuck in your coverlet neatly and sit on the end of the bed to tie your shoes in the morning! At this time of writing, I own several pieces of the Pacific Rim maple furniture and our children own several different pieces. We own an Arts and Crafts style king size bed with modified lowered footboard, the six drawer chest and the as well as two bedside tables. The children own a crib, a lingerie chest [used for baby clothes] and bunk beds in various styles. So you can see as a family we are great fans of this furniture. We have owned the pieces for about ten years and they look almost as good as they day we bought them. An optional boxspring design adds 4' to the posts, and features a larger footboard, taller head and foot posts and lowered side rails.